What does this tell me? Six out of 10 times he got on base, Rickey was going to attempt to steal. Did that include times when it would probably benefit his team more if he didnÃ¢â‚¬â„¢t attempt to steal? Most likely, but Rickey had Lou BrockÃ¢â‚¬â„¢s record to break. You might be asking, Ã¢â‚¬Å“What the hell is this guy basing this on?Ã¢â‚¬Â Well, if the numbers donÃ¢â‚¬â„¢t do anything for you, consider this at least partially a character study. I think most Yankees fans that saw Rickey halfheartedly run for fly balls over his head and go half-speed on the bases to protest his contract Ã¢â‚¬â€œ until he was traded back to the AÃ¢â‚¬â„¢s Ã¢â‚¬â€œ would question whether winning was his true motivation. Amazingly, all AÃ¢â‚¬â„¢s fans seem to love Rickey unconditionally Ã¢â‚¬â€œ even though he dogged it like nobodyÃ¢â‚¬â„¢s business in 1992 after Jose Canseco received a contract greater than his. 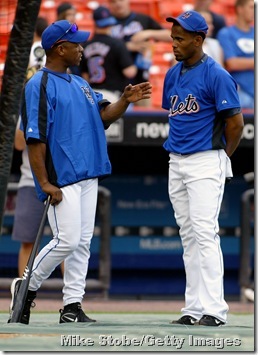 I watched Rickey intently both as a player for the Mets and later as a coach. 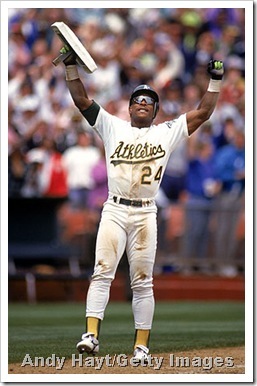 And my friends, RickeyÃ¢â‚¬Â¦ was all about Rickey! You can start with the card game with Bonilla while the 1999 Mets were fighting for their lives in Game 6 of the NLCS. And after hearing ad nauseum how much Jose Reyes learned about plate discipline and basestealing from Rickey, we all had to watch as he demonstrated that heÃ¢â‚¬â„¢d also learned from his mentor how to be a diva prone to a weird, moody attitude and extended funks at the plate and in the field, which in part likely contributed to the teamÃ¢â‚¬â„¢s disastrous collapse of Ã¢â‚¬Ëœ07. If Rickey was so amazingly valuable, why did he change teams 13 times? When it came down to it, despite his physical gifts, Rickey was not an easy guy to have around. IÃ¢â‚¬â„¢m not taking away the incredible disruption that Rickey could create Ã¢â‚¬â€œ for his opponents, even more so than his own team Ã¢â‚¬â€œ nor the fact that he could take over a game singlehandedl y if he deigned to. IÃ¢â‚¬â„¢m also not taking away that nobody was better at reading a pitcher and a situation to steal a base; he made it an art form that was glorious to watch. And I admit to having watched live his steal of third to break Lou BrockÃ¢â‚¬â„¢s career record, and being delighted to witness it. This is just a reminder to take the bad with the good. 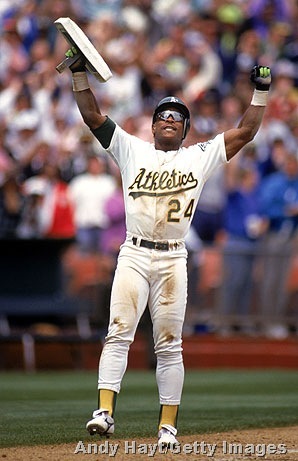 Rickey won a championship with the AÃ¢â‚¬â„¢s in 1990 and another with the Blue Jays in 1993, and his vast talent was of course instrumental in both of them. Rickey was not merely along for the ride. But while you celebrate his induction into the Hall this weekend Ã¢â‚¬â€œ and his speech, which I admit was entertaining, though IÃ¢â‚¬â„¢d imagine he had some help with it Ã¢â‚¬â€œ just remember that when it came down to it, Rickey was all about Rickey. Why else would he keep attempting comebacks long after his prime? I realize he was in great condition until the end Ã¢â‚¬â€œ probably still is Ã¢â‚¬â€œ but he just wanted to tack on to his numbers to make sure nobody would match them. Oh right, I forgot, he loved the game. Do his negatives diminish his talent or accomplishments? Of course not. And the same traits that made Rickey exasperating at times are likely the same ones that helped make him great. But if you tell RickeyÃ¢â‚¬â„¢s story, just make sure you tell the whole thing.